In conjunction with our latest White Paper, Politics Beyond the Ego, Duncan Enright, director of LeaderShape Global, has written an article offering insights into the reasons behind the failing of the UK's approach to Brexit negotiations and explains why the next generation of leaders must lead beyond the ego. 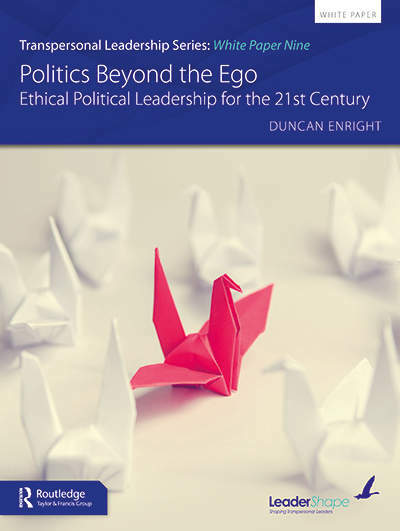 In a new white paper entitled “Politics Beyond the Ego: Ethical Political Leadership for the 21st Century”, published by Routledge and part of a series on Transpersonal Leadership, I have argued that in these troubled times, we need political leaders who lead beyond the ego. We call them Transpersonal Leaders. We need political leaders who are prepared to lead in a way that is radical, ethical and authentic – who go beyond their ego to inspire with vision, reach out to others to share power in a democratic style. They must also show empathy, develop new leaders to succeed them, value and encourage diversity, and have an ethical touchstone visible through the choices they make and the decisions that flow from those choices. They need to be resilient, but not by shutting out all other voices, instead through being highly emotionally intelligent. The utter shambles of the Brexit negotiations on the UK Government side illustrates well the problems that emerge when politicians fail to create a climate in which a positive culture can drive change. Consider the following errors made by the Conservatives and others in choosing to fight a referendum on EU membership, the way the arguments were presented, and then in negotiating a future for Britain outside the EU. For many years UK political leaders, particularly in the Conservative Party, have struggled with the issue of EU membership. A large number of members of Parliament and others came to see the EU as a threat to national sovereignty, and more saw the rise of new forces such as the UK Independence Party as a threat to their position. Prime Minister David Cameron believed that EU membership was necessary in a global economy, but decided to risk continued membership in a referendum to appease factions in his own party. His personal standing and five years of “austerity” government in which wages and public services were squeezed while capital accumulated in few pockets were certainly contributory factors in a slim vote against his position: Britain voted by a small margin on a moderate turnout to leave the EU. Brexit was born, therefore, from a decision that arose from sectional interest in the Conservative Party, and not in the wider interests of the country. A politician leading beyond the ego would not have gambled with the security, economy and wellbeing of the country for sectional interest. Instead they would have sought to understand the driving forces behind the anti-EU sentiment and acted to reform the UK’s relationship, in a transparent and ethical way. The conduct of the referendum, and the arguments made before and since on the EU in Britain on both sides, and in particular on the Leave side where Remain arguments on economic facts are dismissed as “Project Fear”, have been rooted in opinion and emotion. Our political leaders have, through their behaviour, created a climate in which division and hatred have blossomed. Empathy has been driven out, and all the tools of media and social media have been deployed to drive a wedge between “Leave” and “Remain” voters. Never in recent history have our political leaders – Conservative, Labour, Liberal Democrat, Nationalist or other - displayed so little empathy, and trust has been lost while positions hardened. This has led to polarisation, in Parliament and the country, so despite promises made there has been little real engagement with other parties (or even within her own party) by Prime Minister May during her negotiations. Nor has Jeremy Corbyn, Labour Party Leader and Leader of the Opposition, reached out beyond his core support. A misguided and poorly managed negotiating team has not shown that it is willing to share objectives for Britain. It has instead shown a singular lack of vision about what will happen after Brexit. Even in 2019, as negotiations draw to a close, there is no articulated and inspiring vision for Britain’s future from any of our UK leaders. Fragmentation of purpose extends right to the UK Cabinet and the fissures get wider in Parliament, the nations and regions of the UK, and across the whole country. This contrasts with an EU position which is remarkably united despite the diverse interests of the other 27 member countries. EU negotiators and leaders have shown solidarity and common purpose, willingness to make the best deal possible given the “red lines” the UK set down, and always offering to keep the door open for Britain to reconsider. When speaking of a democratic style of leadership, I don’t just mean winning more votes. I mean reaching out to a wide range of opinion when making judgement on key decisions, to allow buy-in and support toward a consensus to build and to consider all points of view. It is hard to think of a Prime Minister and a government that has failed quite as badly as Mrs May’s in this regard. She is well known to be a hard worker, but is often accused of not sharing her work with others and presenting solutions as a fait accompli. Brexit negotiations were never going to work that way, and the lack of any bridge building or buy-in is evident in the complete rejection of her Brexit deal by record margins in Parliament. In their own ways, leaders of the opposition including Mr Corbyn of Labour have not reached out, instead preferring to keep their cards close to their chest. At the Labour Conference in September 2018, many delegates arrived determined to forge a pro-Europe policy, supporting a “Remain and Reform” strategy for the EU backed by a vote on the final deal: a “People’s Vote”. The Labour Leadership obfuscated and has managed since then to fudge what was a clear and overwhelming desire at the Conference for this positive position. Thus a small group at the top of the party have been unwilling to engage with the wider party on this issue. Instead, by reaching out to all members of the EU early on, Donald Tusk and Michel Barnier and other EU leaders have forged extremely high levels of buy-in and support from all EU members. Their solutions and positions have commanded unanimous support, while they must look on the UK delegation with bafflement. Personnel changes and confused arguments reflect an utter lack of the democratic style from Theresa May and others (including opposition leaders, who have also struggled to articulate a clear position with wide support) in the UK. What the UK needs, what the world needs, are political leaders willing to operate beyond the ego. The Brexit shambles in Britain exposes a generation of leaders who have little or no emotional intelligence, operating for sectional and/or self-interest, and quashing honest and open debate. This has opened up and encouraged a divide in the country which will take decades to heal. What Britain needs is new political leadership, leading beyond the ego and their own self-interest. These leaders will articulate an inspiring vision for the UK. They will reach out to all sections of society, to hear diverse opinions, acknowledge grievance, and unite around solutions through using a democratic style of leadership. They will bind the cracks in society by displaying true empathy, listening with skill and confirming through their words and actions that they have heard and understood. They will behave ethically, with transparency and honesty, and own up to their mistakes. They will be resilient, but not by shutting themselves away, instead by reaching out to others and building a wide base of support for a way ahead. The next generation of political leaders must be transpersonal. How we need them now. 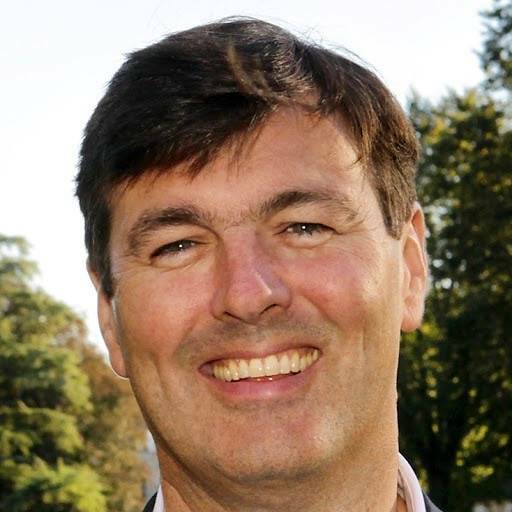 Duncan Enright is a director and faculty member of LeaderShape Global engaged in developing transpersonal leaders. He has also spent over 40 years in active politics. Alongside his political career, Duncan has spent over thirty years developing publishing programmes to support professional development. Duncan is an experienced leader, coach and trainer. In our brand new white paper, Politics Beyond the Ego, discover how leaders must develop themselves and become transpersonal leaders for the sake of our planet. Do you want to learn how to lead beyond your ego, embed authentic, ethical and emotionally intelligent behaviours into the DNA of your organisation, build strong and collaborative relationships, and create a performance enhancing culture that is ethical, caring and sustainable? 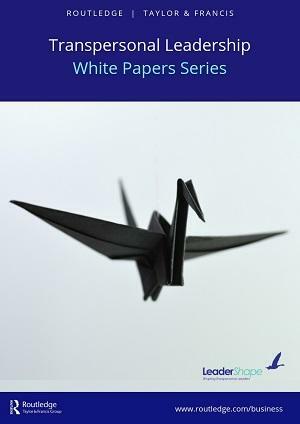 Provided to you by Routledge and LeaderShape Global, our collection of eight white papers covers many aspects of transpersonal leadership.